Are they in their own little world or what? Maybe they are trying to save ink. 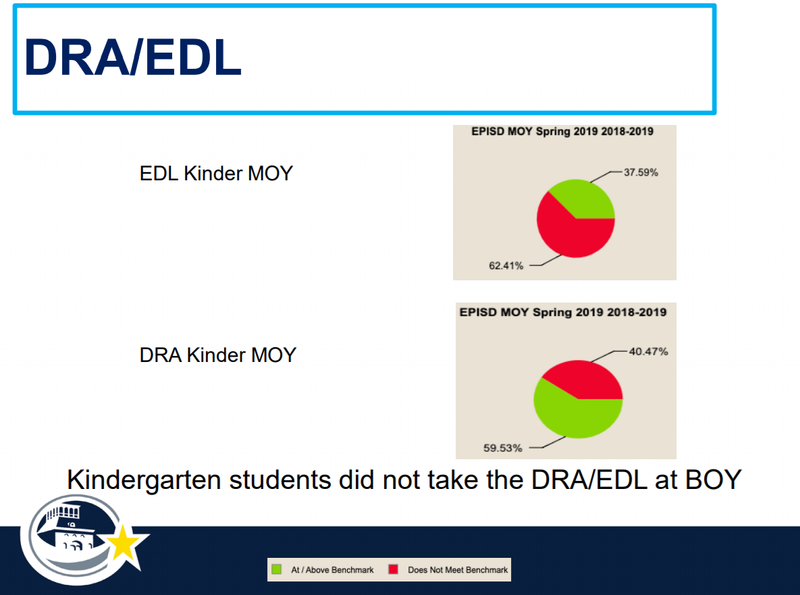 I for one don’t know whether kindergarten students not taking the DRA/EDL at BOY was a good thing or not. Maybe writing in code is considered to be a skill at the district. This entry was posted on Tuesday, April 9th, 2019 at 5:00 AM and is filed under El Paso Independent School District. You can follow any responses to this entry through the RSS 2.0 feed. You can leave a response, or trackback from your own site. Having taught kinder for over 30 years it became apparent to me that the more we tested and moved to rigor in academics in kindergarten I saw an increase in discipline problems. It is not age appropriate to test 5 year olds on a computer to measure their academic progress. So how do we keep track of their progress? The teacher monitors and asseses. I did not need a computer or MOY or EOY it DRA to tell me which students needed intervention. It takes away from instructional time. As for giving kinder students a pass on academics and just teaching them social skills; that would be fine if everyone did it, but they don’t. People have and do educate their children at home prior to entering school. Today, most middle class kinder students arrive knowing their basics, if not reading already. Kinder has always been used to bring up low socio-economic students who were not provided books or educational experiences as children. When kinder became the norm, it was pre-kinder that was to become the great playing field leveler. If we don’t monitor the progress of their reading skills, how do we know who to help and with what? But now that kinder is universal, students coming in with certain skills are expected to be taken to the next level; regardless of where they start. Today the playing field still isn’t level because if everyone grows the same amount during their kinder year, those that came in with more skills will exit with more skills. You might even argue that students that arrive at kinder better prepared will get more out of their kinder year than those who arrived with the hope of being ‘caught-up’. In all seriousness, I think the point of this post wasn’t the particular acronyms used, it’s the fact the board was presented with information that was incomplete. This is of concern because skeptical voter must assume then that the board rarely reads or pay serious attention to the material that is provided them. Furthermore, the district administration probably knows the trustees’ lack of capacity for absorbing detail and just feeds them crap like what was posted here. It underscores the skeptic’s impression of smoke and mirrors coming from EPISD to mask the greed and corruption of the district leadership. Maybe Cabrera is doing the trustees a favor by providing them with plausible deniability. They can always say they never knew! EDL: Evaluación del desarrollo de la lectura. Research based and widely field tested, EDL2 helps students become independent successful readers by giving educators the right mix of tools necessary to assess reading engagement, oral reading fluency, and comprehension. EDL2 helps educators in dual-language, bilingual, and immersion classrooms identify each student’s reading ability, document progress, and implement effective reading instruction. Teachers observe, record, and evaluate changes in students’ performance reading in Spanish. DRA: Developmental Reading Assessment® | Second Edition PLUS (DRA2+) is a formative reading assessment system that allows teachers to assess student reading level and observe, record, and evaluate changes. Kinder students should be learning how to follow instructions, work together, play together and other social norms. They’ve made kinder the new first grade and it is not in the best interest of the child. Stop testing kinder students! Know your place people; this is some of the new heuristic approach to education. These slides are chalked full of meaning. It’s obvious that educating our children is an advanced, scientific task that we common folk simply do not understand and are il-equiped to manage. As a matter of fact, we might mess things up by getting in their way. We should always trust the experts over at EPISD and leave the educating to them. Who are we to question what we don’t understand? Don’t forget that Juan Cabrera considers ethics and transparency his top priorities. I’m sure the meaning of these slides is perfectly, crystal clear to the experts at EPISD and to their honest trustees. Anyway, if they needed help reading the slide they are perfectly capable of getting a consultant to help them. Remember, it’s not what they provide to us in the way of information that matters, it’s just that they cared enough to give us something. We should be grateful. This is all GRE/EK to me. Oh wait a minute. l think l figured this out. The 62% are grateful that they’re not the remaining 38%. Reading comprehension assessments. BOY: Beginning of Year. MOY: Middle of Year.